To make sure you achieve anything you set your mind to. 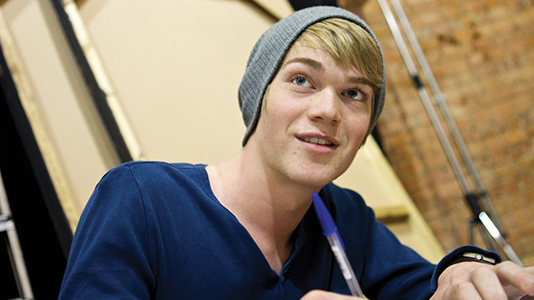 You'll benefit from the School’s professional relationships with the creative and cultural industries. These links directly impact the relevance of our course content, offer employer engagement opportunities and improve student employability. You’ll be taught in small practice-based groups, with opportunities for interdisciplinary work. Our staff members are active in their creative fields as practitioners, photographers, artists, DJs, film makers, and musicians. The following film, focused on BA (Hons) Sound Design, provides an insight into the CVs of our academics and evidences the wealth of experience they bring to their teaching. This just is one example of many. View the School of Arts and Creative Industries YouTube playlist to see all our films. Studying here you'll have lots of freedom to discover yourself as a practitioner and critic. 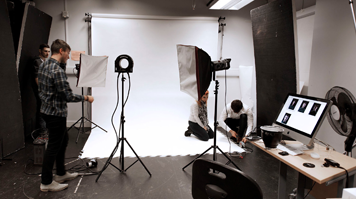 We'll support you to develop your own creative expression and style through experimentation. Whether you are writing a radio play, making films, creating soundscapes or games, producing improvised dramatic performances or delivering a community arts project we encourage you to take a wide range of roles and responsibilities that mirror the working world. This approach stretches our students' ambitions and builds their confidence and ability to seize the opportunities in the sector that are right for them. I feel very prepared to go into the arts industry. When I came to LSBU I very much wanted to be an actor, and that was all I thought about. Now I want to write and produce my own work. View the School of Arts and Creative Industries YouTube Playlist to see all our films. The School’s links with industry and LSBU’s dedicated Careers Service will help you find work placements and jobs in sectors such as arts education, film, media, museums and galleries, new media, photography, television and video games. Our careers page and individual course pages have specialist information on placement opportunities. The Student Centre at LSBU is a central hub for support and employment information, group study and meeting staff informally. It offers students support in IT, maths and communication skills for academic and professional development. The centre is also home to the Students' Union, café and bar. LSBU’s Southwark campus is within easy reach by bus, train, London Underground or bicycle. Stay in our halls of residence or nearby in private rented accommodation and you'll have the perfect base to explore the city and its many world-renowned attractions. Opened in 2012, the Borough Road Gallery collection contains valuable and significant works of Post War British Art. The Gallery provides a window into the university for the public as well as a cultural hub for the university community offering staff and students a programme of engagement in the understanding and enjoyment of the visual arts. For many of our students it will create the start of a lifelong love of visual art; it is home to many of our Arts and Festival Management students and also supports our PhD research studentships focused upon curation, performance and media exhibition. The mission of LSBU is “to be recognised as an enterprising civic university that addresses real world challenges”. At LSBU, we provide students and alumni with a supportive environment to develop entrepreneurial skills and gain the confidence to start and grow successful businesses. One example is our national award-winning South Bank Photography Collective which gives students the chance to run their own photographic business, selling their work commercially across a wide range of clients. The School provides students and alumni with a supportive environment to learn entrepreneurial skills and gain the confidence to start and grow successful businesses. Visit Student Enterprise for more information. The South Bank Collective is LSBU's newly registered creative agency giving photography students commercial experience and entrepreneurial skills. The scheme supports entrepreneurial students to explore and develop the commercial potential of their final year projects. High-achieving graduates from the BA (Hons) Game Cultures course - Erlend Gresfrud, Kalli Karllson and Rohan Feldmesser - were all offered places on the LSBU Enterprise Associate Scheme. Successful applicants receive financial support, mentoring and training.